Online using Online Patient Services– to register please print and complete our registration form or ask for one at reception. Note a limited number of appointments will be available each day for online booking, and a maximum of 8 weeks in advance. Please note: we are unable to process appointment requests received via email or online forms. For medical advice when the surgery is closed telephone NHS 24 on 111. Call 999 in a medical emergency – when someone is seriously ill or injured and their life is at risk. If it is something that the Doctor can only deal with then you will be asked if the matter could be dealt with by telephone or do you require to see a Doctor? When all our appointments have been used for that day the admin staff will ask you if it is something that needs dealt with urgently. This will then be passed to the EMERGENCY Doctor who will assess if you require to be seen that day. If you do, you will be asked to attend the Practice and will be seen by one of the GPs OR if it appropriate, by a Nurse Practitioner. If you are asked to attend - you may have to wait a while before being seen BUT you will be seen that day. These can be book in up to 8 weeks in advance by telephone or online. We endeavour to see patients as quickly as possible but be aware that the national waiting time for a routine matter is approximately 3 weeks. Drs Gourley and MacLaren offer some appointments each week out with the normal surgery opening times. These appointments and are predominantly for patients who work and cannot attend during normal working hours. Please call the practice on 01334 651201 to book one of these appointments. Patient requests for home visits are always a high priority for action. Patients are asked to request a home visit before 09.30am where possible, in order for doctors to plan their day. All requests for a home visit will be triaged (clinically assessed) by the duty doctor, no matter what time a patient or carer telephones the practice. Please be able to give a contact telephone number, preferably a landline, for the doctor's return telephone call. A home visit is appropriate for any patient who is confined to their home for medical reasons only, otherwise they will be asked to attend the surgery to be seen. The practice respects the privacy, dignity and cultural and religious beliefs of it’s patients and are committed to providing a safe, comfortable environment where patients and staff can be confident that best practice is being followed and everyone’s safety is of utmost importance. All patients are entitled to have a chaperone if they so wish for any consultation or examination where they feel one is required. Wherever possible we would ask that you make this request at the time of booking the appointment so that arrangements can be made and your appointment is not delayed in any way. Where this is not possible we will endeavour to provide a chaperone at the time of request, however on occasion it may be necessary to reschedule your appointment. Your health care professional may require a chaperone to be present for certain consultations or examinations in accordance with best practice. As a courtesy to our patients, the practice does offer a text message appointment confirmations and reminder service. If you would like to receive this service, please advise reception and they will ensure that your contact derails are up to date. On arrival at the practice for your appointment you should check in so the system can be updated to alert the doctor that you are waiting. 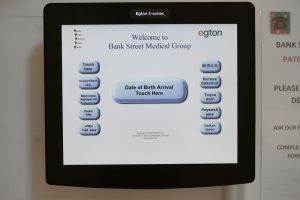 Instead of waiting in a queue at the reception desk, why not use the touch-screen (housed in the main entrance) to check in. It is simple to use and lets the Doctor/Nurse know that you have arrived for your appointment. The practice runs some of its Phlebotomy Clinics from the outpatients department in the Adamson Hospital. If your appointment is for bloods you may be asked to check-in at the Adamson Hospital Reception.